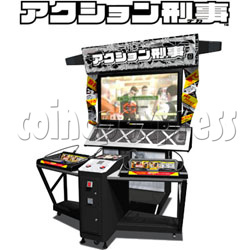 Action Deka is a motion controlled arcade game released by Konami, with fighting exciting attacks by a controller on hand. The controller is a multi-function action controller, including shooting gun action, punch action, throwing action, and drive action. For shooting gun action, the players can move the controller forward as a gun and shoot enemies like any regular a light gun game. The gun is with the trigger button; turn off the screen, holding a shield, and to reload the bullet. For punch action, players can shake the controller for fast punches to beat down the enemies, straight or hook, each divided into upper and beat. For throwing action, throwing the controller by stand in front to match the red line and throw together the enemy's sights! Throw before being shot! For the drive action, the controllers are also used to mimic steering a car and tossing stuff like plates. character: Jake Terry, Luke Stewart, Millie Speranza, Beffy, Hana, Stein, Zaemon, Lee, etc.